The Gossamer Albatross is a human-powered aircraft built by American aeronautical engineer Dr. Paul B. MacCready's company AeroVironment. On June 12, 1979, it completed a successful crossing of the English Channel to win the second £100,000 (£496938 today) Kremer prize. The aircraft was designed and built by a team led by Paul B. MacCready, a noted American aeronautics engineer, designer, and world soaring champion. 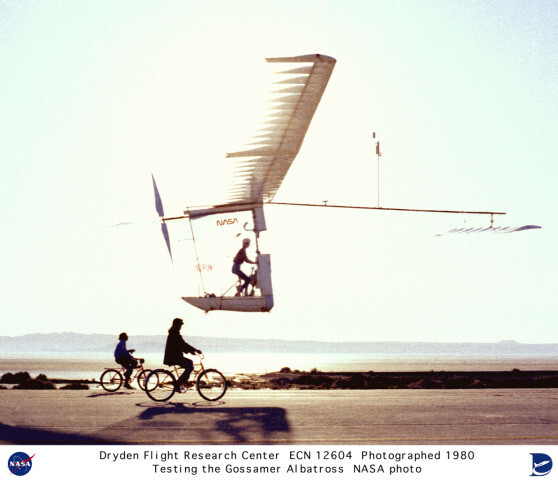 Gossamer Albatross was his second human-powered aircraft, the first being the Gossamer Condor, which had won the first Kremer prize on August 23, 1977, by completing a 1-mile (1.6 km)-long figure-eight course. The second Kremer challenge was then announced as a flight across the English Channel recalling Louis Blériot's crossing of 1909. The aircraft is of "canard" configuration, using a large horizontal stabilizer forward of the wing in a manner similar to the Wright brothers' successful Wright Flyer aircraft and powered using pedals to drive a large, two-bladed propeller. The Gossamer Albatross was constructed using a carbon fiber frame, with the ribs of the wings made with expanded polystyrene; the entire structure was then wrapped in a thin, transparent plastic (mylar PET film). The empty mass of the structure was only 71 lb (32 kg), although the gross mass for the Channel flight was almost 220 lb (100 kg). To maintain the craft in the air, it was designed with very long, tapering wings (high aspect ratio), like those of a glider, allowing the flight to be undertaken with a minimum of power. In still air, the required power was on the order of 300 W (0.40 hp), though even mild turbulence made this figure rise rapidly. Just before 6 am on June 12, 1979, amateur cyclist and pilot Bryan Allen, powered the Albatross to the rehearsed speed of 75 revolutions per minute and took off from a point near Folkestone, England. The Channel conditions and lack of wind were ideal for the crossing. However, issues soon started to affect the aircraft and pilot. Allen's radio failed and he was only able to communicate with the accompanying boats by hand and head movements. Next, Allen's water supply had been estimated for a two-hour flight, but headwinds delayed the crossing and his supply ran out. Without adequate water, Allen suffered from dehydration and leg cramps. On-board instruments were also affected by the extension to flight time, with the batteries for the airspeed instruments and acoustic altimeter failing, so Allen no longer knew his height or airspeed. With increasing headwinds, concern grew that the flight would have to be called off. With the coast of France still unseen, an accompanying boat maneuvered in front of the Albatross to hook it to safety. However, during this time, Allen had gone a little higher and found less air turbulence, and he continued to pedal the aircraft and see if progress could be made. With a calming surface wind, Allen continued, and landed on a beach at Cape Gris-Nez in France. Allen completed the 22.2 mi (35.7 km) crossing in 2 hours and 49 minutes, achieving a top speed of 18 mph (29 km/h) and an average altitude of 5 ft (1.5 m). MacCready's team built two Albatrosses; the back-up plane was jointly tested as part of the NASA Langley/Dryden flight research program in 1980 and was also flown inside the Houston Astrodome, the first ever controlled indoor flight by a human-powered aircraft. The Gossamer Albatross II is currently on display at the Museum of Flight in Seattle, Washington. Alistair Cooke devoted some of his Letter From America broadcast of 15/17 Jun 1979 to Allen's achievement. For his work on the Gossamer Albatross, MacCready was later awarded the Collier Trophy. ^ a b "Gossamer Albatross ECN-12665". NASA. Retrieved March 26, 2015. ^ "Gossamer Albatross". Smithsonian National Air and Space Museum. Retrieved March 26, 2015. ^ "Gossamer Albatross". AeroVironment, Inc. Retrieved March 26, 2015. This page is based on the Wikipedia article MacCready Gossamer Albatross; it is used under the Creative Commons Attribution-ShareAlike 3.0 Unported License (CC-BY-SA). You may redistribute it, verbatim or modified, providing that you comply with the terms of the CC-BY-SA.